09 Dec 2018 - 8-year-old twins Daniyal Eijaz Azman and Shiraz Irfan Azman have overcome their phobia of mathematics since they enrolled in Seriously Addictive Mathematics (S.A.M) enrichment programme two years ago. 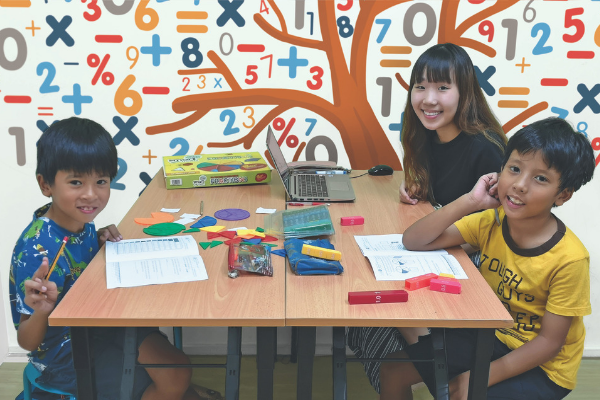 Budding interest in mathematics: Daniyal Eijaz Azman (right) and Shiraz Irfan Azman (left) together with Ms Cindy Chua, trainer from Seriously Addictive Mathematics (S.A.M) Jurong branch. The S.A.M programme is a mathematics enrichment programme for students aged four to 12. When they were in primary one, Daniyal and Shiraz, both from Frontier Primary School, would tell their parents that they did not know how to answer mathematics questions, especially word problems. They repeatedly failed or got average marks for their mathematics tests or examinations. “We also took a long time to finish our mathematics homework from school. Now, we are more confident and enjoy mathematics.” said Daniyal and Shiraz through e-mail. Seeing the twins struggle with the subject led their father, Mr Azman Hairi, a 48-year-old engineer, to search for an enrichment programme that could help them improve in mathematics. “In my conversations with Daniyal and Shiraz, they told me that they did not know how to solve word problems and they did not like mathematics. “They found it hard to follow what is taught by their mathematics teacher in school. “As the class sizes in school were big, we understood that it would be difficult for the teachers to teach at the level of each individual student. “I found the Seriously Addictive Mathematics (S.A.M) programme through the video-sharing website YouTube and I was drawn by how the trainers taught mathematics. So, I decided to enrol my twins in the S.A.M programme.” said Mr Azman through the phone. Explaining what drew Mr Azman to the S.A.M programme, he said that the programme offers classes as small as five to six students and the trainers teach according to each individual student’s level. Furthermore, he found that S.A.M trainers go through mathematics questions step by step in order to ensure that students understand the concepts rather than just memorising the procedures. 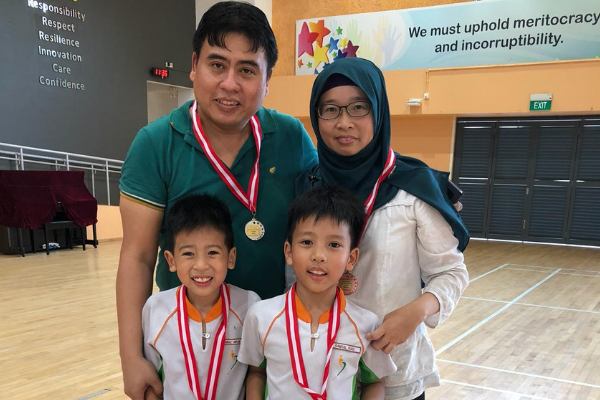 Family support: Daniyal Eijas Azman (front, right) and Shiraz Irfan Azman (front, left) have the support of their parents, Mr Azman Hariri and Mdm Faridah Zainal Ali, in pursuing mathematics. Daniyal and Shiraz adds that they were able to learn mathematics concepts through games that are relevant in their daily lives. “In S.A.M class, our trainer, Ms Cindy Chua, is very patient. She encourages us to ask questions. Before, we were too shy to ask questions. But now, we have the courage to speak up in class. “Ms Cindy also constantly reminds us that it is not just about getting the right answers. We can make mistakes and learn from them because mathematics allows us to improve our problem-solving and thinking skills.” said Daniyal and Shiraz through e-mail. Commenting on the curriculum offered by the programme, Ms Jess Tan from S.A.M said “We focus on helping students understand mathematics concepts. When children understand the reasons for doing something, they have the desire to try and as a result, develop an interest in learning mathematics. Through the S.A.M. programme, Daniyal and Shiraz saw improvements in their performance in mathematics, even scoring full marks in some of their school tests. More importantly, they enjoy learning mathematics and no longer have a phobia answering mathematics questions. “I hope to see my twins continue to be enthusiastic and enjoy learning mathematics. I do not want them to simply memorise concepts and do practice questions without understanding basic concepts,” said Mr Azman. A version of this story first appeared in The Berita Harian.